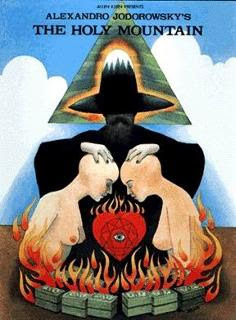 I recently saw the 1973 consciousness-shifting cult film "The Holy Mountain" of the amazing filmmaker Alexandro Jodorowsky. The film was entirely financed by John Lennon and Yoko Ono and produced by Beatles manager Allen Klein and the film was not widely released until THIS YEAR. Bottom line - go get it, and watch it! He was recently interviewed and had some cool things to say. BTW - we'll see about how long the humans will last. I think what we do in the next few years may be a determinant! "How do you see the future of humanity ? Human kind will live as many years as the universe. It will live until the end of the universe. It is its goal. It will then be acknowledged by the whole universe and will become its consciousness. Then it will create another universe. You are one of the few artists that have a large audience who dares to illuminate people with fulguration. Why should I try to touch people through politics ? I am not interested in political revolution, I am only interested in poetic revolution. Why shouldn’t I try to touch people by spiritual means ? I have a spirit. I can feel it. Why should I limit myself to being a rational being when I feel my unconscious is as big as an ocean ? And why should I see myself as limited when I feel that my thoughts are unlimited ? Why should I consider myself as having been defined when I feel indefinable ? How can we end this interview ? The best way to finish something is finishing it... But I would say that nothing ever ends. Everything carries on. Our paths have met. You’re going to follow your own path and I’m going to follow mine. We are not born, we don’t die. Everything is continuation. Since you alluded to the world’s future, have a look at this laid-back cat. If anybody were happy as this cat, then everything would be fine. There are moments of peace in this world, like this cat. If there is a moment of peace, it means that it exists. The evidence - here it is - you see here we have a miracle. Look at the pleasure that this cat has in communicating with a human being. I’m not his master, I’m only a human being. It could take exactly the same pleasure with you. Do you want to see ? Take the cat...You see... Stroke it... Here it is, it’s yours. Peace is yours."